shafts as much as 12x18 feet in diameter. sump or pool at the bottom of the shaft. From the sump it is pumped out. The slight inclination of the tunnel also facilitates the transfer of the substance mined to the shaft. If the tunnels are parallel with a mineral vein, they are called drifts. When they cut the vein, they are called cross-cuts. Tunnel is a rather indefinite name which may be applied either to drifts or cross-cuts. The process of drifting and cross-cutting is called "driving a level." Tunnels are usually as much as 6x6 feet in section. Tunnels are often run at various levels; for example, tnnnels may be run at the 50-foot level (that is, 50 feet below the surface), at the 100-foot level, at the 150-foot level and so on. 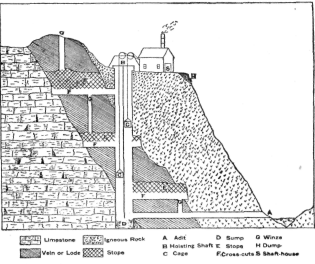 When the drifts and cross-cuts have been made, and the different levels put in communication by vertical shafts, the ore between the various openings is said to be "blocked out." Some ore has been extracted in the process of blocking out the ore. When a body of ore has been blocked out, extraction of ore begins in earnest. The processes employed for loosening the substance to be mined are various. Sometimes it is loosened by the pick or some other sort of hand-tool. Sometimes it already is soft or incoherent. Often it is so hard that it must be blasted. Ore is often worked from below rather than from above. That is, ore between the 50-foot level and the 100-foot level is often worked from the latter and carried along it to the main hoisting shaft. The working out of the ore between levels is "stoping." Another problem which the miners have to encounter is the drainage of the mine. In most deep mines the amount of water seeping in is great, and it must be pumped out about as fast as it enters. For this purpose force-pumps are used. In deep mines several or many force-pumps may be needed. Pumps which are able to elevate the water 300 or 400 feet each are in common use. In mines near deep valleys it sometimes is possible to secure drainage by driving a drainage tunnel or "adit" from the shaft to the valley.